Hello Paisley = Bump was bouncing off the wall today seeing you as Queen Cat of the Day.. Bump sends you Lots of Whisker Kissess & Cuddle Huggss.. Congrats my Darling Queen SweetHeart Pasiley.. Have A Very Nice Mothers day..
You are now officially a spider-sister! Happy bday kiddo! Hope you have a fab one! What's on the menu? Where are you going for dinner? Just wanted to wish you a happy birthday!!! Thanks for the welcoming Happy 09! This is great news. I'd hate to see you have to give Paizly to your parents. Hopefully everyone will learn to get along well. Hi Cindy. How's Taz doing? I hope he's getting over his grumpiness. Storm's doing great so far with his Prozac. 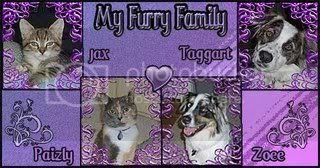 Taz the Tabby (14 years old RB), Zoee the Australian Shepherd (9 1/2 years old RB), Paizly the Dilute Tortie (6 years old), Taggart the Aussie Mix (6 years old), Jax the Tabby (4 years old) and Zeplyn the Cattle Dog Mix (1 year old). I live with my "kids" & boyfriend in Concord, CA.